Telemachus: Was John Maynard Keynes a ‘Keynesian’? After all, it was his revolutionary economic ideas that America turned to in the 1930’s to try to get out of the Great Depression. Since his signature masterpiece, ‘The General Theory of Employment, Interest and Money’ was published in 1936, six years into the Depression, he must have been using the transatlantic phone lines a lot to convince the incoming FDR Administration in 1933 to put his ideas into action. And FDR certainly took Mr. Keynes at his word. It is our opinion that if his theories had worked as planned, the US would have emerged from the Great Depression perhaps in a few years, 3 or 4 at most? Anytime it takes 10 years of massive government spending to ‘get out’ of a recession, we believe that perhaps something else probably could have done it better and quicker. Do you want to duplicate our parents and grandparents’ decade-long experience of their Depression-era struggles as we try to emerge out of this nasty ‘recent unpleasantness’ we are still working through? However, based on some recent reading and re-reading of Sir Keynes writings, we have come to the conclusion that Mr. Keynes might be getting a bad rap nowadays. It seems as if even he would have to be 'uncomfortable' at the very least with being tagged as the ‘main reason’ why we have run annual deficits for 47 of the past 50 years due to our addiction to federal spending. For one thing, he was an amazingly astute and wealthy investor who famously was able to ‘anticipate what other investors would be anticipating’ and made a personal fortune. He also worked with renowned ‘value investor’ Benjamin Graham during the latter part of his life. He did not want to obliterate the private sector with heavy-handed government control as some in Washington seem to believe nowadays. He didn't mind 'intervening' in times of crises or 'steering' the economy when possible even though we think is very difficult to do in a monstrous $14 trillion economy like we have today in America. But here is the real shocker. 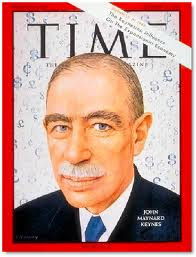 John Maynard Keynes advocated that during boom times, taxes should be raised and/or government spending should be reduced primarily to avoid inflation explosions like the one America had in the late 1970’s under Jimmy Carter (want another one of those nasty episodes as well?). Such inflation-prevention actions by the government would also have the salutary effect of reducing excessive debt on the national books going forward. In other words, John Maynard Keynes supported policies that would aim governments towards 'balanced budgets’ after a period of deficit-spending and pump-priming the economy. Hard to believe. But those 'old-school' guys apparently just presumed that any respectable nation and their duly-elected leaders would not take complete leave of their senses and just overspend until they couldn't borrow and over-spend any more. Guess what? They were wrong. Sir Keynes, wherever you are, take a close look at Greece, Portugal, Italy, Ireland, Spain and right up there with them, the good old U.S. of A, circa 2000-2010. Apparently, modern-day proponents of ‘Keynesianism’ have neglected to read this part of his writings. As we have pointed out numerous times, it is far more fun for proponents of big government to ‘spend more money!’ and never seriously address the more complicated and testy issues of burgeoning national debt and massive annual budget deficits. ‘We know this stimulus spending sounds like a lot of money. It is. But we promise to raise taxes on everyone and cut spending enough when the economy recovers to balance the budget before we leave office’. We can’t even picture this in our wildest imagination. It would take too much courage and leadership. Mr. Keynes is worthy of another read if you ignored him in college. So are the other economists such as Milton Friedman or Friedrich von Hayek. We only ask that if you do read any of their books, or any other economist or historian or philosopher, please read it all and not just the parts that you agree with. Look at where that has gotten us over the years…. That's very true. Amity Shlaes points out in The Forgotten Man that Keynes also cautioned FDR about his anti-business fervor, especially with the utility sector. Keynes has his share of guilt, but he at least understood what FDR and Obama certainly do not, that you cannot demonize the private sector as an inherent evil. thanks for the input...my full recollection of Keynes from macroecon at Chapel Hill is 30+ years dated by now and yours must be fresher than mine. I doubt you will think it is ok when YOUR taxes go way up and YOUR benefits go way down to pay for YOUR old man's and my benefits. Or the Chinese will think it is cool when some wingnut talks about 'reneging on our interest payments to service their $1 trillion debt they hold on us.